The cosmic conscious Egyptians developed their music from the cosmos itself—the harmony of the spheres. The intimate relationship between astronomy and music is the most important fundamental in the Egyptian thinking. 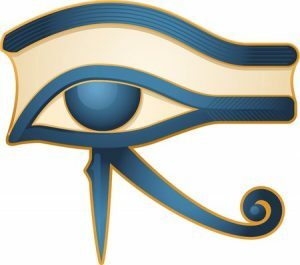 This intimacy is manifested in all aspects of the Egyptian system—as we will see throughout this book. The jubilant Kepler did not state that he himself discovered anything. Rather, it was all Ancient Egyptian. Clement Alexandrinus (200 CE) mentions 42 volumes accredited to the Egyptian Thoth (Tehuti) on various subjects. Two books were on music and four others on astronomy, one containing a list of the fixed stars, another covering the phenomena of the sun and moon, and two others about the rising of the stars. Another contained a cosmography and geography, the course of the sun, moon, and the five planets. Several Ancient Egyptian divinities (gods/goddesses) were associated with music. One of the main musical neteru (gods/goddesses) was Hathor. Her shrines are spread throughout Egypt. Hathor was/is called The Seven Hathors. Present-day Baladi Egyptians call her Saba-banat (meaning Seven Maid- ens). 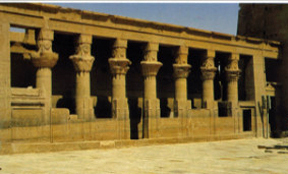 Notice below the 7 columns with Hathor’s head in the photograph from the Philae Temple in Aswan. The sky and its stars make music to you. The sun and the moon praise you. The neteru sing to you. The text of this hymn consists of seven stanzas (equal to the seven metaphysical spheres). Each stanza consists of four lines (equal to a tetra-chord). Hathor was called the Mistress of Singing and the Mistress of Dancing. The Seven Hathors represent the intimacy of music and dancing to the seven planets nearest to us—on Earth. 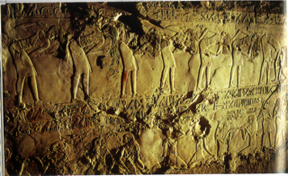 Notice below the seven dancers from the Philae Temple in Aswan. All swiftly vibrating, whirling (dancing) bodies produce sounds like a vibrating string that produces sound when it is struck. The sound produced from the string depends—among other things—on its thickness/weight, the speed of its movement, and its distance from the human ear. Likewise, the sounds (relative pitches) produced from the whirling planets are a function of the weights of the bodies, their particular speeds, and their relative positions. To recognize the impact on Earth by the heavenly sounds, Earth is considered unmoving, at the center of all things. The seven planets that have impact on us Earth dwellers are, from the nearest to the farthest: the Moon, Mercury, Venus, Sun, Mars, Jupiter, and Saturn. They revolve, some in a larger and some in a lesser orbit. Those that have the lesser orbit revolve faster, and those that have the larger revolves more slowly. 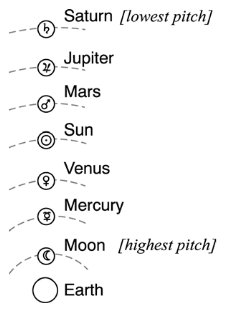 The Moon, situated nearest to the Earth, is the swiftest- moving body, therefore producing a note of the highest pitch. Saturn, the highest in the heavens (and farthest from Earth), produces the lowest pitch. The movement of the seven planets is melodious. The changing speed, direction, orbit distance, and sizes of the seven planets produce the seven natural tones known as the diatonic scale (Do, Re, Mi, Fa, Sol, La, Si). The custom of referring the days to the seven stars called planets was instituted by the Egyptians, but is now found among all mankind, though its adoption by other countries has been comparatively recent; at any rate the ancient Greeks never understood it. But since it is now quite the fashion with mankind generally and even with the Romans themselves, and for the Egyptians is already an ancestral tradition, I wish to write briefly of it, telling how and in what way it has been so arranged. I have heard two explanations, which are not difficult of comprehension, it is true, though they involve certain theories. For if you apply the “principle of the tetrachord” (which is believed to constitute the basis of music) to these stars, by which the whole universe of heaven is divided into regular intervals, in the order in which each of them revolves, and beginning at the outer orbit assigned to Saturn, then omitting the next two name the lord of the fourth, and after this passing over two others reach the seventh, and you then go back and repeat the process with the orbits and their presiding divinities in this same manner, assigning them to the several days, you will find all the days to be in a kind of musical connection with the arrangement of the heavens. This is one of the explanations given; the other is as follows. If you begin at the first hour to count the hours of the day and of the night, assigning the first to Saturn, the next to Jupiter, the third to Mars, the fourth to the Sun, the fifth to Venus, the sixth to Mercury, and the seventh to the Moon, according to the order of the cycles which the Egyptians observe, and if you repeat the process, covering thus the whole 24 hours, you will find that the first hour of the following day comes to the Sun. And if you carry on the operation throughout the next 24 hours in the same manner as with the others, you will dedicate the first hour of the third day to the Moon, and if you proceed similarly through the rest, each day will receive its appropriate planet. This, then, is the Egyptian tradition. See the 24 x 7 Ancient Egyptian musical pattern, as per the above statement of Dio Cassius, which is shown shortly below. 1. 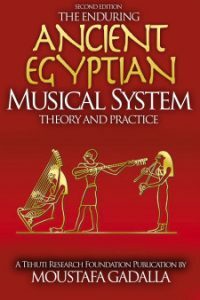 The relationship between the seven days of the week and the harmonic natural sounds of the diatonic scale was instituted by the Ancient Egyptians. Such a relationship was a consequence of the heavenly music of the seven (wandering) planets. The custom of referring the days to the seven stars called planets was instituted by the Egyptians. . . .and to them already an ancestral tradition. . .
2. 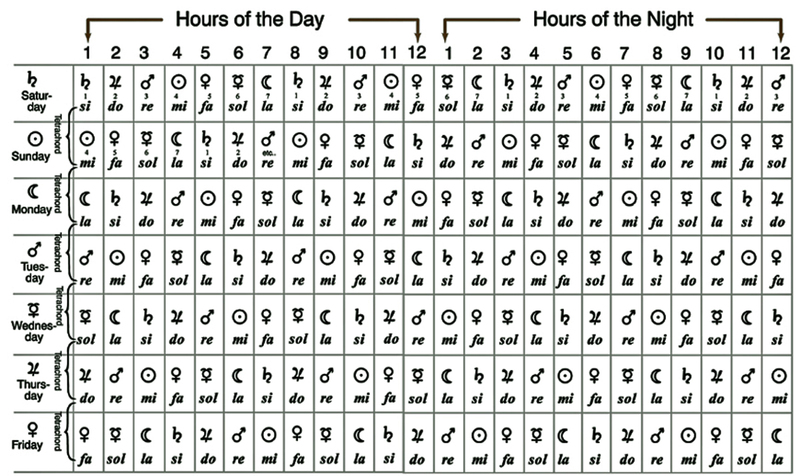 The relationship between the seven planets and the days of the week (as practiced by the Egyptians), according to Dio Cassius, started with Saturn. If you apply the “principle of the tetrachord” (which is believed to constitute the basis of music) to these stars, . . .
Tetrachord is a word that simply means four strings. The essential parts of the tetrachord were/are the top and bottom strings. These made a Perfect Fourth with each other. The “Perfect Fourth”, as such, is the sound made by the fourth natural tone from any given note. If we start the scale at, say C (Do), its fourth will be F (Fa) in the ascending scale. 4. The division of the day into 24 hours also comes from the Egyptians. By applying the first of the planets (Saturn) to the first hour of the first day of the week, and in each following hour, the next planet, in the order stated previously, we will find, by repeating alternatively the same order, that the first hour of the second day will correspond to the Sun; the first of the third, to the Moon, and so on. The division of the day into 24 hours and the week into 7 days provides the perfect harmonious pattern, where the order of hours (days) coincides with the distribution by Fourths between consecutive days. In other words, one system could not be established without the other. 5. Dio Cassius stated specifically that neither the Greeks nor the Romans have divided the day into hours, nor the month into portions of seven days, or weeks. It is from the Egyptians, as Dio Cassius testifies, that the other peoples have taken this usage. . . .its adoption by other countries has been comparatively recent; at any rate the ancient Greeks never understood it. But since it is now quite the fashion with mankind generally and even with the Romans themselves, and for the Egyptians is already an ancestral tradition. 6. The purely Egyptian 24 x 7 musical table provides a system with coordinate axes that corresponds with the Ancient Egyptian game of checkers, which was the basis for choosing proper tones and modes, based on the diagonals drawn from a particular reference point. This type of thinking concurs with the Egyptian astronomical texts that are called diagonal calendars and diagonal star clocks. In other words, the choice of proper tones and modes is intimately related to the harmony of the spheres.